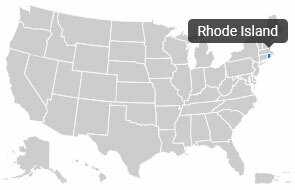 As the smallest state in the US with an area of just 1,545 square miles, Rhode Island has a total county list of only 5. Despite its small size, don’t underestimate Rhode Island because it has a thriving industry that boasts jewelry lines, electrical equipment, machinery, shipbuilding, and every metal related or manufacturing industry you could think of. In history, the Rhode Island was the last of the thirteen original colonies to be declared as a state. The state’s founder, Roger Williams, was the one who instituted the first Baptist Church in the country (1638). It is also home to the longest running observance of the 4th of July since 1875 in Bristol. Despite its small area, Rhode Island’s Per Capita Income of $ 28,707 during the year of 2010, is higher than the country’s Per Capita Income of $ 27,332. Rhode Island just like any other state in the United States sees hundreds, even thousands of moves each year. Some people move for business, others due to education or leisure. Whatever the reason may be, there is one thing that remains the same for all relocations- the success of a move relies on the work of great movers. Hiring professional movers is the best option for people who want a quick and hassle-free move. Customers should look for movers that have proper licenses and accreditation, sufficient equipment and manpower, as well as extensive experience in the industry. As a safety precaution, avoid movers that only give phone estimates and stay away from those who ask for unreasonably huge upfront payments. What you need are legit and licensed movers that will help you with the entire moving process. Local and interstate relocations can be a real challenge especially if you don’t know where to start. But you don’t have to worry because with Top Mover Quotes, you can get easily get started with your move. Just fill out a short form and we’ll connect you with quality movers that offer the best prices in the market. All of this happens in the quickest possible time. All you have to do provide some basic information and within minutes, you’ll get quality quotes from actual moving companies that are licensed and accredited with government agencies. Moving from one home to another is challenging but it can be done. With Top Mover Quotes, your relocation is just a few clicks away. Economy Movers & Storage is a full service company specializing in Commercial and Residential moves as well as Piano/Organ Moving, Rigging and Crane Service throughout Rhode Island. We also offer labor only assistance to load or unload your moving truck or container, or simply moving furniture around your home in preparation for a remodel project. We are fully licensed and insured with a staff of expertly trained, courteous, professionals. We are a family owned and operated business. We keep it simple. You won't find any secretaries or salesmen here. Have a question? Speak to the owner. A problem or concern? Speak to the owner. Booking a job? You guessed it, speak to the owner. Our hands-on approach eliminates communication breakdowns and enhances our customer service. Established in 1976 Over 30 years of straight growth and serving thousands of customers, we have established a name that people can rely on and trust in the moving industry. If you are looking for a local mover for your residential or commercial move ranging from one item to an entire corporate office, we are a great option! Meet the Business Owner: Bob N.
After growing up in a family of movers, I had my own ideas how I would run a better moving company and to exceed our clients' expectations with graceful customer care. My goal every day is to never forget the core principles that have made this business successful. Hands-on operations and personal accountability are just a couple of the things that separate Economy Movers & Storage from the rest of the field. there's always a good possibility I will be out there on your job! Self Storage, Fedex, UHaul, moving and storage supplies. Established in 2006 New England Self Storage provides storage solutions to businesses and individuals. Meet the Manager: Michael l.
Larry O'Toole founded Gentle Giant with a friends borrowed truck and a $17 investment: a one-time ad in the Boston Phoenix. O'Toole felt strongly that Massachusetts sorely needed an infusion of quality into the moving industry, and in 1984 committed himself fully to that mission. As noted in the company mission statement, written by O'Toole himself, "We treat our employees with respect and compassion, and expect that they will extend the same courtesy to our customers. "The goal of the company has always been to provide full-service moving "by the greatest team of movers ever assembled," with "no questions asked" customer service, with the mission of making every customer a customer for life. The company takes the "Gentle" part of its name very seriously and does everything possible to ensure a safe, effective, hassle-free move. While this was actually a new concept in the moving industry when Gentle Giant was founded, it has since become the norm, spawning numerous imitators. Established in 2005 Larry O'Toole founded Gentle Giant with a friends borrowed truck and a $17 investment: a one-time ad in the Boston Phoenix. O'Toole felt strongly that Massachusetts sorely needed an infusion of quality into the moving industry, and in 1984 committed himself fully to that mission. As noted in the company mission statement, written by O'Toole himself, "We treat our employees with respect and compassion, and expect that they will extend the same courtesy to our customers. "The goal of the company has always been to provide full-service moving "by the greatest team of movers ever assembled," with "no questions asked" customer service, with the mission of making every customer a customer for life. The company takes the "Gentle" part of its name very seriously and does everything possible to ensure a safe, effective, hassle-free move. While this was actually a new concept in the moving industry when Gentle Giant was founded, it has since become the norm, spawning numerous imitators. A native of Ireland and 1973 engineering graduate of Northeastern, where he rowed competitively, Larry O'Toole was a rising executive at Eaton Co. when he quit his job to "escape corporate slavery" and pursue his writing interests while investigating the possibilities of starting a light manufacturing company. On a quest for start-up cash, the 6' 6" O'Toole - the original Gentle Giant - was urged by his friends to add moving to his list of odd jobs.A rower since college, O'Toole is competitive, disciplined, and persistent. A creative problem solver, he prides himself and the company in being able to step in and complete difficult moves with enthusiasm after Gentle Giant's competitors have quit the job in frustration. His efforts have been rewarded, since O'Toole has been recognized for his excellence in leadership by the US Small Business Administration as 2004 MA Small Business Person of the Year and the Cambridge Chamber of Commerce as its 2004 Business Person of the Year.